One of the major sources of microbiological particles in the operating room is from the surgical staff and is proportional to the number of people moving about in the room. The goal of any system is to isolate the patient from the microbiological particles produced by the surgical team and the support staff in the operating room. AirGuide offers a modular Laminar Flow system designed to create a clean zone to suit almost any application. AirGuide's Critical Environment Controlled Air Laminar Flow System consists of our Laminar Flow Perimeter Slot Diffusers (CECA-LFPSD) and the Laminar Flow Diffusers (CECA-LFD).Specially designed to create a clean zone around the patient in the operating room with an air curtain between the patient and the surgical staff, this system establishes an invisible barrier to airborne microorganisms. It protects and isolates the clean zone from contaminated room air and personnel that are outside the curtain. The AirGuide Laminar Flow system with HEPA Filter Diffuser uses the proven concept of vertical air mass technology which produces a nonaspirating, low velocity, uniformly distributed downward moving piston of conditioned air. These high quality diffusers may be used individually, or as in the case of hospital operating rooms, several units may be linked together to sufficiently cover the area and produce one large combined laminar mass. 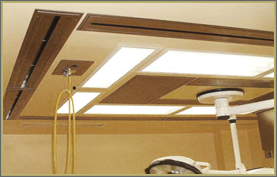 Installed in an operating room above the operating table, the clean conditioned air flows over and blankets the operating table, effectively isolating the patient from contaminated air. Directing air straight down and at a steady even velocity across the face, this diffuser provides the ideal air flow that is low enough not to disturb items in the work area but high enough to remove contaminated air. The Laminar Flow Diffuser "LFD" Series utilizes the well-proven and time-tested concept of vertical air mass 'laminar flow' technology. Our LFD produces a non-aspirating, low velocity, uniformly distributed downward moving 'piston' of conditioned air. In addition, the LFD is designed to accommodate a Gel Seal HEPA or ULPA filter, which can be easily removed and replaced from the face of the unit. These high quality filters incorporate a separatorless 2" deep media, integral test port and an anodized aluminum gel seal frame. They may be used individually, or as in the case of hospital operating rooms, several units may be linked together to produce one large combined laminar mass. The only significant amount of room air infiltration occurs at the outer boundary of the laminar flow mass, outside the confines of the operating table. The patient is therefore bathed in 'clean air' and effectively isolated from secondary room air and any airborne contaminants. 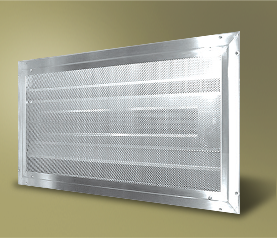 The ability of the CECA-LFD to maintain a sterile environment directly below is enhanced by the use of low level exhaust grilles located around the room periphery which remove the contaminated air before it can react with the boundary layer of the laminar flow mass. • Installed in operating room above operating table. • Used for clean room applications such as research, animal or pharmaceutical labs, as well as food processing plants, microchip plants, and other protective environment rooms. 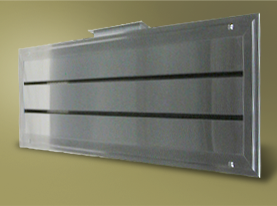 The Laminar Flow Perimeter Slot Diffuser "LFPSD" Series is specially designed to provide an air curtain for operating rooms. The unique slot design of the LFPSD creates a continuous curtain of air, angled outwards 5o - 15o, that encloses the operating area and minimizes the possibility of contaminated air entering the surgical area. The double slot design creates a uniform velocity curtain that minimizes infiltration of contaminated air into the curtain air stream. It also creates a wider velocity profile with less turbulence and hence less induction over similar two slot designs. The face design also incorporates longitudinal deflectors that horizontally deflect a small amount of air lengthwise, thereby joining sections and corners with a truly continuous curtain, resulting in enhanced isolation of the surgical area. 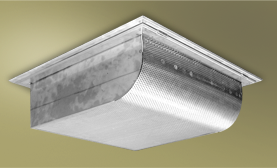 The Hinged Radial Pattern Diffuser "HRDP" Series comes with or without a HEPA or ULPA filter. 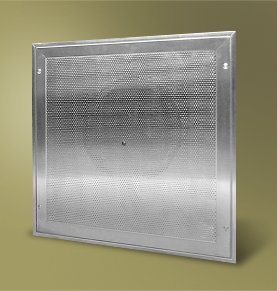 Designed to provide low aspiration and high ventilation rates especially for clean room applications, the unique design of solid baffles in an intrusive perforated face can handle large volumes of air with low initial face velocities. The curved face design is pleasing to the eye, without unsightly sharp angles. Engineered design and performance are the result of extensive laboratory testing. The face of the diffuser is attached to the plenum with two stainless steel hinges; the opposite side is secured with 1/4-turn fasteners. The diffuser face simply hinges down for easy access to the interior for cleaning and sanitation. The HRDP-2 model introduces air in a semi-cylindrical 180o radial flow pattern, flushing a room with large volumes of clean conditioned air and minimizing infiltration of contaminated air. The HRDP-1 model introduces air in a 90o radial flow pattern for perimeter applications. HRDP with filter incorporates an extended plenum and a unique frame designed to accommodate a Gel Seal HEPA or ULPA filter. These high quality filters can be easily removed and replaced from the face of the unit. Also incorporated is a separatorless 2" deep media, integral test port and an anodized aluminum gel seal frame. The Flat Radial Diffuser "FRD" Series comes with or without a HEPA or ULPA Filter. Designed to provide low aspiration at high ventilation rates with internal baffles and a pressure plate for an excellent radial air pattern. Especially suited for clean room applications such as research laboratories, animal labs, food processing, hospital rooms and computer rooms, this diffuser allows large volumes of air to be supplied at low level velocities. The unobtrusive flat face design provides the smooth appearance required for architectural excellence. The FRD-2 model introduces air in a semi-cylindrical 180o radial flow pattern, flushing a room with large volumes of clean conditioned air and minimizing infiltration of contaminated air. The FRD-1 model introduces air in a 90o radial flow pattern for perimeter applications.